Ok. So firstly I should wear necklaces more often. Generally I should probably accessorise more, because it tends to make you look more put together, and, theoretically it’s fun. Only problem is that i can’t find accessories that i like. Inspired by Craftlog’s post I clicked over to Art School Dropout’s site. Her necklaces are incredible! You should stop reading this and go check them out. Point being, the final piece is full of lots of little memories – which is a very cool side of the Use What You Have challenge that I hadn’t considered before. Very cool! I like that you are using what you’ve got! I need to get some new jewlery too. My jewlery pouch was “removed” from my luggage in September when I was traveling. I’ve been throwing together a few things here and there. I think it is time to do some shopping/creating! Hola! I finally, finally put up pictures of the lovely goodies you sent me in February. I’m going to try to add them to the flickr group today, too. 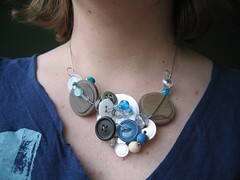 Your necklace is a work of art! I see new photos on Flickr… I’m smelling a new post here. I think it’s in the oven, still cooking a bit.